Confirm that life could exist outside Earth. Check. Explore the ancient geography of Mars. Check. Become a social media powerhouse. Check. NASA's Curiosity -- and the humans who make her work -- have racked up several accomplishments during the rover's first Earth year on Mars. After traveling more than 300 million miles in eight months, Curiosity blazed through Mars’ atmosphere Aug. 5, 2012, before gently coming to a rest on the red planet at 10:32 p.m. PDT. She had to decelerate from 13,200 mph to just under 2 mph in a matter of minutes. The landing was NASA's seventh on Earth's neighbor; many other attempts by the U.S. and other countries to zip past, circle or set down on Mars have gone awry. Among Curiosity’s goals are determining if life ever existed on Mars, characterizing the climate and geology of the red planet and preparing for human exploration. Since landing, Curiosity has traveled more than a mile along the Martian surface (pictured below) and gathered "incredible data" along the way. She’s determined that Mars is a suitable home for life, found evidence of an ancient streambed, learned radiation could pose health risks for future human explorers and discovered major environmental diversity just in the landing area alone. But it hasn’t been all work and no play for Ms. Curiosity. She’s achieved four Martian "mayorships” using the social media check-in app FourSquare, kept 1.3 million Earthlings updated via Twitter, and has taken plenty of photos – including one famous “selfie." So, what’s next for NASA’s most advanced rover ever sent to Mars? 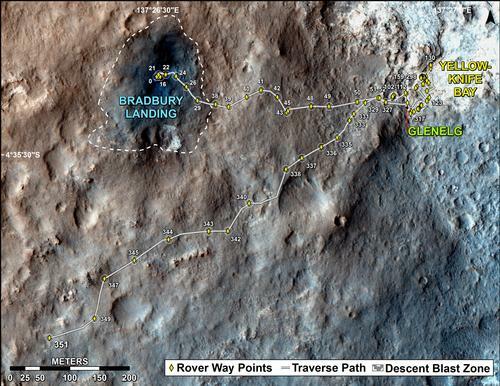 The 1-ton Curiosity will trek toward the foothills of Mount Sharp, an 8-kilometer trip that is expected to take the slow-moving rover several months to complete, said Rick Welch, a NASA JPL engineer who has been working with Curiosity for eight years. Because Curiosity can’t explore every interesting rock she sees along the way, four stops have been factored into the trip, Welch said. 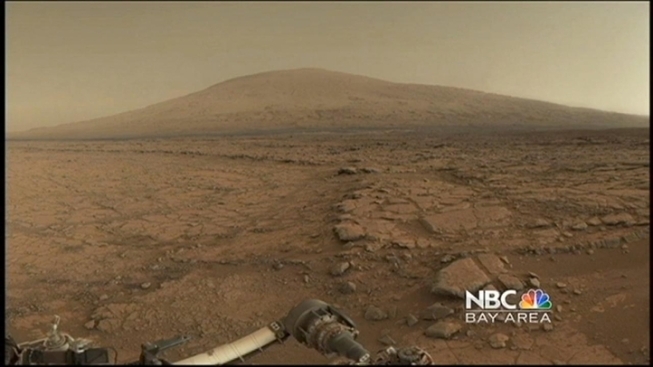 When she gets to the foothills, Curiosity likely will find lots of layered material, Welch said. Newer material layered atop ancient material will give Curiosity a peek into Mars’ geological history. Orbital data of the foothills suggests there also may be clay in the area, and where there was water, there may have been potential for life, Welch said. While Curiosity is paving the way for manned missions to Mars, Welch said a timeline for such a milestone is still hazy. “People talk about all the time but it’s very, very expensive,” Welch said. “We have a constant human presence in the orbit around the planet, [so] it’s part of the natural evolution to go to a planet,” he added. Designed and built in Pasadena, Calif., Curiosity will continue to explore the red planet for a Martian year – about 687 Earth days – and will endure at least one Martian winter in the process. Science fans can join in Curiosity's anniversary week celebrations by visiting NASA JPL's website, where they'll be greeted by a festive rover lighting her own celebratory candle (pictured below) and multimedia "presents."